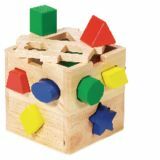 Classic toy that develops eye-hand coordination, creativity, spatial orientation and color recognition. 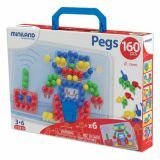 It comes with a transparent board so children can follow the pattern below, creating images with pegs. 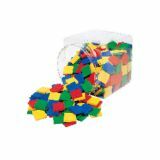 Inviting, chunky shapes–bumpy on one side, smooth on the other–slide over 2 5/8" plastic pegs. 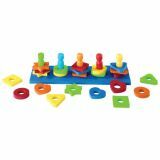 Promotes finger dexterity, eye-hand coordination, and sorting skills. 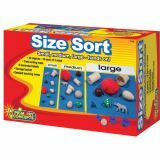 Includes 25 double-thick crepe rubber shapes, 11 1/2" long crepe rubber sorting board and 5 removable pegs. Ages 2 and up. Knock knock. Who's there? 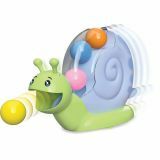 It's the interactive sights and sounds of the Smart Sounds Play House from Learning Resources! 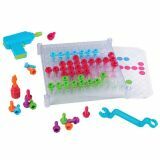 This portable playset introduces kids to fundamental learning concepts through familiar scenes from around the house. 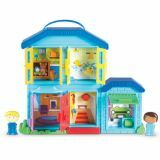 The playset's five vibrantly colored doors each open to reveal a different domestic space: a welcoming entryway, cozy living room, bubble-filled bathroom, snug bedroom, and attached garage. In addition to these colorful scenes, each room also includes an interactive button, switch, or dial, whose irresistible hands-on actions each come with a fun sound. The Latch & Learn Play House comes with two play figures to help kids put themselves in the imaginative action. In addition to developing color identification and fine motor skills, kids can also work on their ABCs and 123s with the letters, numbers, and shapes found along the house's eaves. Our hedgehog lost his quills, and only your little ones can help him get them back! New from Learning Resources, Spike the Fine Motor Hedgehog helps kids build up hand muscles and fine motor skills as they replace the chunky, peg-shaped “quills” within the holes that dot the smiling hedgehog's back. 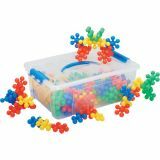 The learning doesn't end there—Spike's colorful quills also lend themselves well to lessons in counting, sorting, and color identification skills. 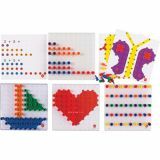 Kids can arrange the quills by warm or cool colors, work on sequences and patterns by alternating colors, or count up the quills with the help of numbers printed on the hedgehog's back. 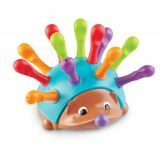 Once playtime is over, Spike the Fine Motor Hedgehog is a snap to clean up—each piece is made of plastic that can be easily wiped clean, and the quills stow snugly inside the hedgehog's body, which adds simplicity to storage too.